Usually, gnome news is good news, but it’s terrible for Darlene Fraga — and her Virgin Mary statue. Vandals snuck on to Fraga’s property in Windsor Locks, Conn., a few weeks ago and hacked off the head of the Virgin Mary statue in her yard. 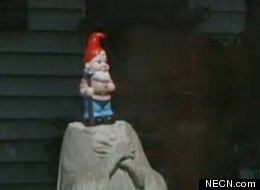 A week later, the head was replaced with a garden gnome. Police investigating the matter don’t have a suspect, but believe kids may be responsible since there have been other reports of random vandalism in the area. Fraga has a different theory: The head hacking was a hate crime against her. Fraga’s friend, Roger Cygan of Somers, is offering a $1,000 reward for information leading to an arrest, according to Associated Press. As hard as it’s been for Fraga, she has yet to move the Virgin Mary statue or the gnome. “I think after I get over the initial shock, I’m going to take the whole thing down,” Fraga told NECN.com. Regardless of whether there are any arrests, Fraga believes the culprit will have to answer to a higher authority. The large reservoir is believed to have been used by pilgrims to the Temple Mount who required water for bathing and drinking. 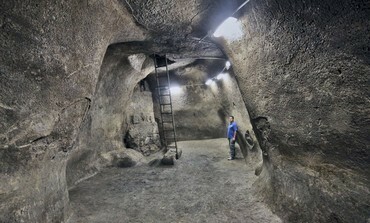 A large water reservoir dating to the First Temple period was uncovered during archaeological excavations conducted by the Israel Antiquities Authority (IAA), in cooperation with the Nature and Parks Authority, near Robinson’s Arch in Jerusalem. She added that the reservoir’s general characteristics typify the First Temple period and resemble ancient water systems previously found near Beersheva, Arad and Bet Shemesh. Upon completion of the excavations, the IAA will examine the possibility of turning the water reservoir into a tourist attraction.